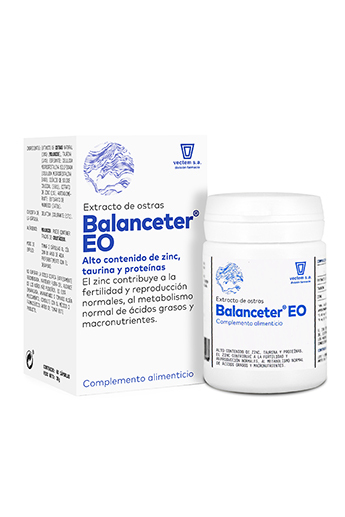 BALANCETER EO , vectem s.a.
BALANCETER EO is a food supplement based on Oyster Extract, Zinc and Taurine. Oyster Extract contains a wide variety of vitamins, amino acids, minerals and micronutrients such as Zinc, Taurine, Omega3, Iodine, Iron, Magnesium and Vitamin B12 among others. Zinc contributes to the maintenance of normal testosterone levels in the blood, and the protection of cells from oxidative stress. In addition, it contributes to normal fertility and reproduction. Zinc is a mineral that contributes to the normal function of the immune system, and to the maintenance of normal bones, hair, nails, skin and vision. It also contributes to the normal metabolism of macronutrients and fatty acids. Taurine is an organic acid involved in the production and action of bile. It binds to certain bile salts, and therefore improves the digestion of fat. It has been found to intervene in a wide variety of functions in the central nervous system, from its development, in the cellular protection ... etc. In addition to acting as an antioxidant, it is an important factor in the development and maintenance of normal retinal morphology and functions.